The World's Columbian Exposition, held in Chicago in 1893, touched off a trend that to this day has not subsided. For the exposition, often referred to as the Chicago World's Fair, the Women's Congress came up with the idea of a "National Garland of Flowers" comprised of flowers representing each of the states of the union. Perhaps this served as inspiration to Wisconsin's Superintendent of Public Instruction, C.P. Cary. Mr. Cary was concerned in 1908 that Wisconsin had no official state flower and he decided to do something about it. As the state's top educator, he took a cue from Rhode Island and decided that the selection of a state flower would be put to the school children in two stages. In 1908, an open referendum would be held to select the most popular flowers for a 1909 showdown among the finalists. Both contests would be held on Arbor Day. The 1908 Arbor Day vote produced four finalists: trailing arbutus, the violet, the white water lily, and the wild rose. These most popular flowers were put to another test on Arbor Day, 1909. With 147, 918 votes cast, the violet was a clear winner garnering more that twice as many votes (67,178) as the second-place wild rose (31,024). Trailing arbutus and the white water lily split the remaining votes, placing third and fourth respectively. On page 876 of The Wisconsin Blue Book , 1929, the text proudly proclaimed that the violet (Genus Viola) was selected as the State flower of Wisconsin by a vote of school children in 1908. The violet remained an unofficial representative of the Wisconsin however until 1948, when the Youth Committee of the Wisconsin Centennial Commission discovered that the violet had never been officially designated as the state flower. With some urgency, a bill was prepared to officially declare the violet the state flower. By an act of the Wisconsin Legislature, Chapter 218, Laws of 1949, Section 1.10 was created and the wood violet (Viola papilionacea) was named Wisconsin?s official flower. After forty years of waiting, the wood violet became Wisconsin's official state flower on June 4, 1949. The following information is excerpted from the Wisconsin Statutes , Chapter 1, Section 1.10(3)(e). 1.10. State song, state ballad, state waltz, state dance, and state symbols. (a) The mourning dove (zenaidura macroura corolinensis linnaus) is the symbol of peace. (b) Milk is the state beverage. (c) The sugar maple (acer saccharum) is the state tree. (d) Corn (Zea mays) is the state grain. 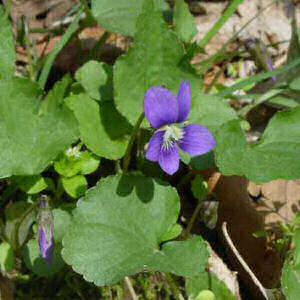 (e) The wood violet (viola papilionacea) is the state flower. (f) The robin (turdus migratorius) is the state bird. (g) The muskellunge (Esox masquinongy masquinongy Mitchell) is the state fish. (h) The badger (taxidea taxus) is the state animal. (i) The dairy cow (bos taurus) is the state domestic animal. (k) The American water spaniel is the state dog. (L) The honey bee (apis mellifera) is the state insect. (m) The trilobite (calymene celebra) is the state fossil. (n) Galena (lead sulfide) is the state mineral. (r) The cranberry (vaccinium macrocarpon) is the state fruit. Viola sororia (Violet): Plant Encyclopedia from MyGardenGuide. Plant Profile for Viola sororia Wild. 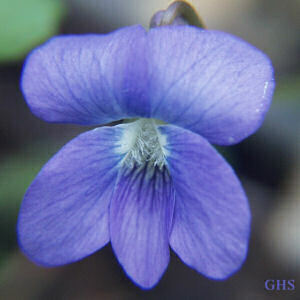 (Common Blue Violet): USDA, NRCS. 2004. The PLANTS Database, Version 3.5 (http://plants.usda.gov). National Plant Data Center, Baton Rouge, LA 70874-4490 USA.